Or: This is what happens when Uncle Serge does gardenia. 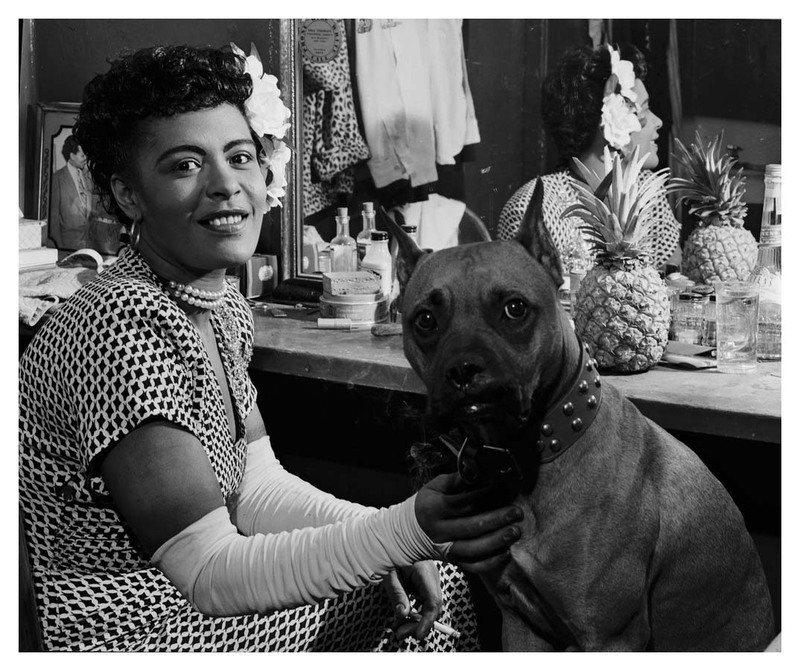 The newest fragrance in Serge Lutens' Exclusive bell jar line, Une Voix Noire, is dedicated to a real human muse, Billie Holiday. That's a Lutens first as far as I know. Interestingly, the ad copy that came with Une Voix Noire is less vague and incomprehensible than usual, though not less poetic. It says: "The stars rise in chorus. The night sky is filled with the light of the moon." 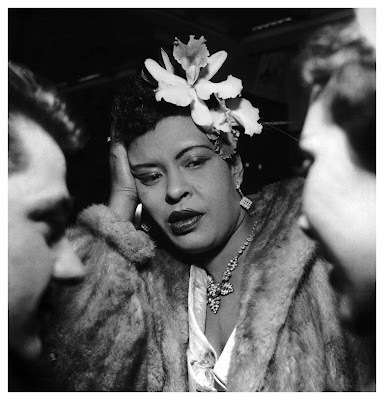 Billie Holiday: the voice, gardenias in her hair, 1920s Harlem jazz clubs, the big bands of the 1930s; but also addiction, abuse, heartbreak and poverty. It all spells lush and dark notes, night air, abundance and decadence. Also decay and melancholia, which are both characteristics of a gardenia note done right. This brings us to the question I've been asked a few times in the last couple of months: is Une Voix Noire anything like Jardenia by JAR (and its distant relative Tom Ford Velvet Gardenia), a perfume known for being all about life and death, using the dirtiest facets of gardenia: earth, blue cheese, and rot. The answer is a resolute "no". Serge Lutens and perfumer Christopher Sheldrake took the theme and shaped it according to their own style and aesthetic. Elena from Perfume Shrine mentions in her review the characteristics Une Voix Noire shares with Lutens' Bois series: the familiar stewed fruit and cedar. They peek behind the sumptuous gardenia that opens the fragrance and remain in the background as the scent unfolds and develops. I do smell quite a bit of dark boozy fruit that works with the rum (and maybe also whiskey) notes. Lutens' gardenia is also tinged with smoke and the petals are a moment past their prime- Victoria Frolova of Bois de Jasmine described Une Voix Noire as a flower on the brink of turning brown and I agree. I'll even add that it smells slightly singed, as though the bouquet was placed too close to a burning candle. Une Voix Noire is a far cry from the green and garden-fresh summery fragrances that populate the gardenia category. It's also very perfumy (and wonderfully so). Not in the heady gardenia-tuberose way, but rather through the spice and musk core and the black velvet-and-fur that define this Serge Lutens creation. While the fragrance remains fairly close to the skin after the initial intoxicating burst (I've been applying from a spray decant), its luxurious dry-down inhabits my personal space for long hours. The bell jar format and the elegant and indulgent dabbing it requires are very appropriate for Une Voix Noire (imagine the bottle on Billie Holiday's dressing table below). Serge Lutens- Un Voix Noire (75ml EDP for 130 euro or horribly marked up at $300) can be found in the Serge Lutens Palais Royal boutique in Paris, Barneys New York and sergelutens.com. Photos of Billie Holiday with and without her dog, Mister, via http://jazzinphoto.wordpress.com. This does indeed sound as if Uncle Serge and Mr. Sheldrake took the time and thought to make a proper tribute to the painful glory of Ms. Holiday. Everything about this sounds perfect for me. 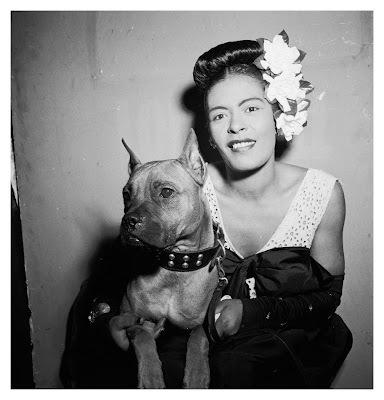 Love Billie, the Gardenia, and the dog. Especially that it is not like other gardenia's, and is turning brown. And, also, I love white flowers.